I am super excited with the ‪#‎IpanemaSelfeet‬ campaign. Find your next adventure and create new memories with #IpanemaSelfeet. Ipanema, the premium Brazilian flip flop brand, takes the Filipinos' love for selfies to the next level with #IpanemaSelfeet. The campaign dares young fashionistas to create their own adventures with Ipanema and capture the memorable moment with a selfeet. To kick start the #IpanemaSelfeet campaign is a series of mall events called IpanemaSelfeet Sunday in key cities like Manila, Cebu and Davao. If you’re in the mall where the event is happening, just take your Ipanemaselfeet, upload your selfeet photo on Facebook or Instagram with the hashtag #IpanemaSelfeet and present it to the Bambu or Ipanema Store to get discounts. The Ipanema Selfeet Sunday events will have stations complete with Ipanema flip flops and fun backgrounds worthy of even the most demanding selfie aficionado. Open to the public, the event will also feature the latest collection of Ipanema, celebrity appearances and entertainment, games and a chance to win free Ipanema flip flops, as well as discounts from the Ipanema store. 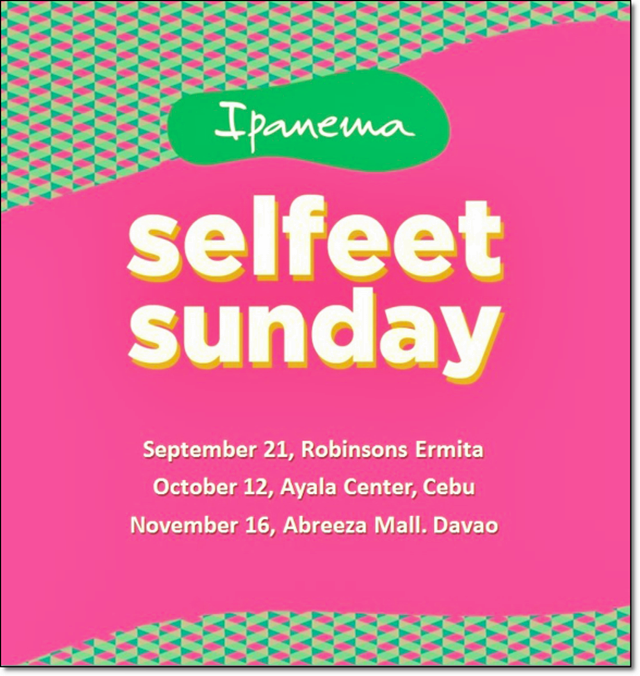 The Ipanema Selfeet Sunday events will start at Robinsons Ermita in Manila on September 21, Ayala Center in Cebu on October 12 and Abreeza Mall on November 16. The fun continues online with the #IpanemaSelfeet contest on Facebook and Instagram. Simply upload your Ipanemaselfeet on Instagram or on the Ipanema Philippines Facebook page with the official hashtag, #IpanemaSelfeet and get a chance to win discounts on Ipanema flipflops! With fashionable designs inspired by the vivid and colorful Brazilian lifestyle and its signature buttery soft sole, Ipanema flip flops are the perfect companion for any adventure -- whether it is to a dream destination or just within the city. No matter where you go, your feet will definitely take you farther in comfort and style. Ipanema flip-flops and slippers are available at Ipanema stores in SM City Lucena, SM Clark in Pampanga, Centrio Mall in Cagayan de Oro, Bambu, Shoe Salon, and leading department stores like SM Department Store, Robinsons Department Store, Rustan’s Makati and Landmark. For more information about #IpanemaSelfeet, visit www.facebook.com/IpanemaPhilippines. I am looking forward to the Ipanema Selfeet Sundays where you stand to win a trip for 2 to Punta Fuego Resort just for creatively posting an #ipanemaselfeet of your adventurous, funky and fun self. Guess who's stepping into adventure this Sunday? James Reid and Nadine Lustre will invade Robinsons Place Manila this September 21, 2014, Sunday with their #ipanemaselfeet! Everyone is invited to join in the fun! See you there! Drop by Robinsons Ermita this Sunday and take an #ipanemaselfeet! Surprises await those who do! Join @jaye.wolf and @nadzlustre on September 21 in Robinsons Place Manila for #IpanemaSelfeet!